Actually built in '98 for Steve Katowitz, this is the only lefty James Hamiltone SRV model in existence. 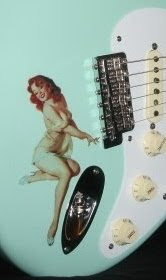 And the fretboard inlay says "Stevie the Kat" instead of "Stevie Ray Vaughan" for obvious reasons. Fortunately, this custom SRV version wasn't made for a cat named Jerome... So any SRV fan and/or Steve out there can still experience harmonious co-existence with this guitar. Even SRV fan's named Jerome! Minnesota based vintage gear mogul, Eddie Vegas is currently listing this unique specimen on eBay. CLICK HERE for all of Eddie's perpetually over-the-top listings. Hamiltone.com has the full story and details of these long scale, thru-neck beasts of Texas Blues.